Ah damn I hate internet buying, I'm more of the type to go into stores and hand over cash with someone. I'm the complete opposite. It must have been years that I've bought a DVD offline. I get most of my DVDs online....I can usually find good prices. I'll pick up some in local stores too when I find good prices...like the cheap $5 DVDs in Walmart. I usually never have any troubles tracking down the films I want in store, and I usually get good prices too. Not long ago I got the original Day the Earth Stood Still and One Flew Over the Cuckoos nest for under 8$ each in store. I doubt I'd be able to get much cheaper than that if I got the same films online, unless they were pre owned and I usually like to buy new. My Thoughts:It was a fun movie, with some hilarious scenes thrown in. My favorite part has to be when Carl and Lois sneak into the hotel, and fall for so many contraptions! Especially when they ended up in a dumpster full of poo! I think it's a cool family film with a little drama and romance to keep the girls into it, and action and hysteria to keep the guys watching it. I give it a family film rating of 4 out of 5. The Plot: Nancy Drew is mvoing for a little while to California with her father, and in the mean time she promises him she'll give up sleuthing. He didn't know Nancy picked a house to live in with a mystery. Soon she is sucked into finding the will of an actress with a mysterious death. My Thoughts: It was a fun movie, and it's funny how everybody else is modern while Nancy is practically stuck in the 1950s. (My dad and I could argue for hours about that, so let's move on!) It has it's funny moments, like in the begining one robber had to tell the other, "Dude, please don't thank her for turning us in!" Still, I say the movie is pretty cool, a little above average, so I give it a 3.5 out of 5. Was it a coincidence that you watched two movies in a row that starred Emma Roberts? Emma is, as I recall, Julia Roberts' niece. I wonder if she's done any other films. I may have to check on that. I've not seen either of these myself though I could see myself enjoying either since I like light-hearted films...and animals. 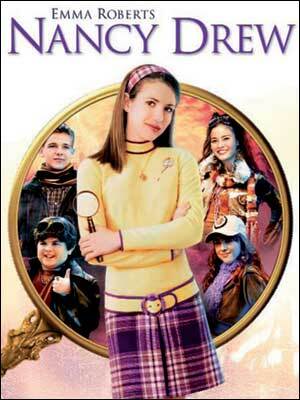 I remember seeing both Hotel for Dogs and Nancy Drew being advertised on television. I had no interest in them, but I think id be interested in seeing them now! glad to hear it Emma, and yeah, the two Emmas in a row are a coincidence. The Plot: An unsuspecting couple and other so investors/children test drive a new amusement park using real dinosaurs from the dino DNA from the blood stored in a misquito trapped in amber. What the guests didn't expect was the dinos getting out. My Thoughts: Considering it was made back in 1993, the special effects were pretty good. I still can't wrap my mind around people being stupid enough to try to bring back dinos, especially raptors and T-rexs. There was some humor in it, and the action (dino chase) scenes were cool too. I really hink there is something about it that made it a classic, so I can't wait to watch 2 and 3 soon! I gotta give this one a 4 out of 5. I haven't watched this movie in years! As I told you... I have 2 and 3 that you can watch any time you want. And if you like them there is always Godzilla. I love the animatronics in JP they still look amazing against CGI today. :p although as for the sequels, Lost World... is kind of weird, not a big fan of that one although I generally like most of the actors in it :/ JP3 is a pretty good film, not as good as the original but still a fun film. The one scene I could never wrap my head around is the one when the T-Rex breaks loose. First we see the goat and the the T-Rex behind the fence, same level to the cars. Once he is out and pushes down one of the cars there suddenly is a 90 foot drop...?